May 18, 2016 - Becoming a pilot is a financial risk. In Europe, you'll pay around €100,000 for the training itself, but no job is guaranteed. Many pilots say we should graduate during a good period for hiring, but the risk of not finding a job is still present and we cannot avoid it. 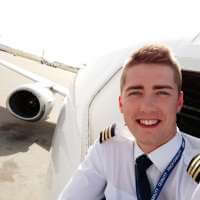 The purpose of this blog is to show you every step I go through to become an airline pilot. And so it is quite obvious that have to tell you more about the financial aspect of training. I made a chronological list which exists of all the costs I have made so far and will make in the future. Every school has different pricings, every person has a different lifestyle, but it all comes down to this: becoming a pilot isn't something you just do for fun. When I was still studying in high school I decided to give up one of my holidays to study physics. It was necessary for me to follow a physics course to refresh my memory for the entry exam. The course is not mandatory, but it helped me out a lot. As part of the entry exam, we have to be checked in a medical institution. This is in order to get the Medical Class 1. An expensive examination, but an important one of you want to become a pilot. Unfortunately, the entry exams aren't free either. Conclusion: if I wouldn't have passed the entry exams, I would've lost €1091,86. I'm still happy to say I passed, but the big invoices were yet to come. Like most of the other students, I have a loan of €79.000 with the bank. The loan is an account which starts at €0 and can go to minus €79.000. Whenever the account goes into minus, we pay interest. It is, however, possible to deposit money in the account so you do not go below €0. Unfortunately, we all end up in the red zone after some time (unless you win the lottery or something). Once I graduate, I have 20 months to find a job before I have to start paying back the money from the bank. Some students take only a few weeks to find a job, for some others it takes years. The only thing I can do is make sure I am ready for the interviews when I graduate so I do not waste any time. A loan isn't free and can cost a lot of money. To give you some idea of what to expect, the total cost of my loan will be around €100.000 (79.000 + interest) after 9 years of monthly payments. My training cost is €97.500 and I cannot cover that with the loan I have. That's because a personal contribution is expected to show you have the necessary means to pay for training. The €97.500 is split up into multiple invoices which need to be paid at certain stages of training. Our theoretical training comes down to about €10.000 and once we go to the US, multiple invoices of €17.500 will need to be paid. I'm sharing an apartment together with two colleagues, but also our living costs are evenly split. We spend around 20 days a month in the apartment meaning that with €200-€250/month we should be safe. That all comes down to a bit less than €2000 in eight months, but let's round up just to be sure. The hunt for cheap housing wasn't an easy one, but we found the solution. Most students rent a room at about €450 per month and that's just too expensive in my opinion. That's why I decided to rent an apartment with my two friends as an alternative. We're paying about €600 per month which makes renting an apartment a great deal if you have people to share it with. €200 per month per person comes down to €1600 throughout the eight months of theory. When we go to the US for the practical part of our training there are some costs as well. We'll only be there for five to six months, but I decided to keep an extra margin for possible trips! After our return from the US, we will complete the rest of our training in Belgium. Flying in Antwerp, briefings in Brussels and then into the jet simulators! The costs made during these last few months consists mostly out of transportation and living costs. Please note that the numbers I used are rough estimates, but it does give you an oversight of what to expect. If everything goes according to plan I will graduate in May 2017. Then it's time to find a job and pay back the loan! "Student pilots are rich"... a wrong statement which is believed by many people. Most people do not have a spare €100.000 and that's no different for student pilots and their parents. But what's the reason for the high cost of flight training? There's more than one to be honest. Let's make things simple: flight schools are seen as a private education meaning that the government does not provide any support. All costs made by the school are paid by the students which is already quite a lot of money. Flying itself isn't cheap either. Fuel, taxes, maintenance, personnel (instructors, examiners, planning)... a big list of matters increasing the cost of training significantly. For many years there have been discussions with the government about possible financial support, but it seems like that will not happen in the near future. My training will end up costing me somewhere around €130.000, but that's not where the story ends. Once you're hired by a company you might have to pay for your own type rating, a specific training for the airplane you will be flying. Some airlines pay for this training, others don't. A type rating will cost you between €25.000 and €35.000 depending on the airline and the airplane. Once you're finally in the right seat, you might have €160.000 of debt. I always say that my dream goes beyond a loan at the bank, but we have to stay realistic and think about all the risks involved in becoming an airline pilot. If you have any further questions about my training or the financial aspect of it, feel free to leave a comment below. See you next week! Hi Bob, great article first of all to read, very interesting to see the breakdown of the costs involved with flight school, I was wondering if for your loan you have to own a property to secure the loan you took?